How to Reset iPod to Restart a Frozen Click Wheel iPod? An iPod is just like computer, which may also need a restart. So this page will show you how to reset iPod to restart a frozen clickwheel iPod. Want to transfer 7000 songs from iPod to computer in 20 mins? 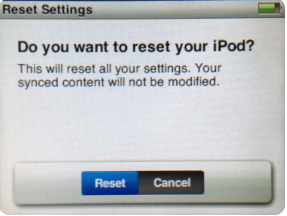 Start download now before reading this How to Reset iPod guide. Apple iPod has edged out Sony Walkman and became one of the best entertaining gadgets. But a iPod may also get stuck and it just freezes. Don't worry. Similar with a computer, iPod may also work improperly. So you just need to reset your iPod to unfreeze it. 1. Switch the Hold button on and off. 2. Press on and hold the Menu and Center buttons at the same time as long as the Apple logo appears, about 6 to 8 seconds. You may need to repeat this step. If the above steps did not work, try connecting iPod to a power adapter and plug the power adapter into an electrical outlet, or connect iPod to your computer. Make sure the computer is turned on and isn't set to go to sleep. Try resetting the iPod while it is connected to power. Unlike restoring an iPod, to reset iPod will not erase songs on it. still and all, if you have over 16,000 songs on your iPod classic, however, your old computer with all that music crashed, do you want to lose all the music and playlists that are on the iPod itself? Go find a solution here..